Could ikigai lead to longer and better living? Ikigai also has historic links: gai originates from the word kai, which means shell. These were considered very valuable during the Heian period (794 to 1185), according to Akihiro Hasegawa, a clinical psychologist and associate professor at Toyo Eiwa University, adding a sense of "value in living". Finding the answers and a balance between these four areas could be a route to ikigai for Westerners looking for a quick interpretation of this philosophy. But in Japan, ikigai is a slower process and often has nothing to do with work or income. In a 2010 survey of 2,000 Japanese men and women, just 31% of participants cited work as their ikigai. Gordon Matthews, professor of anthropology at the Chinese University of Hong Kong and author of What Makes Life Worth Living? 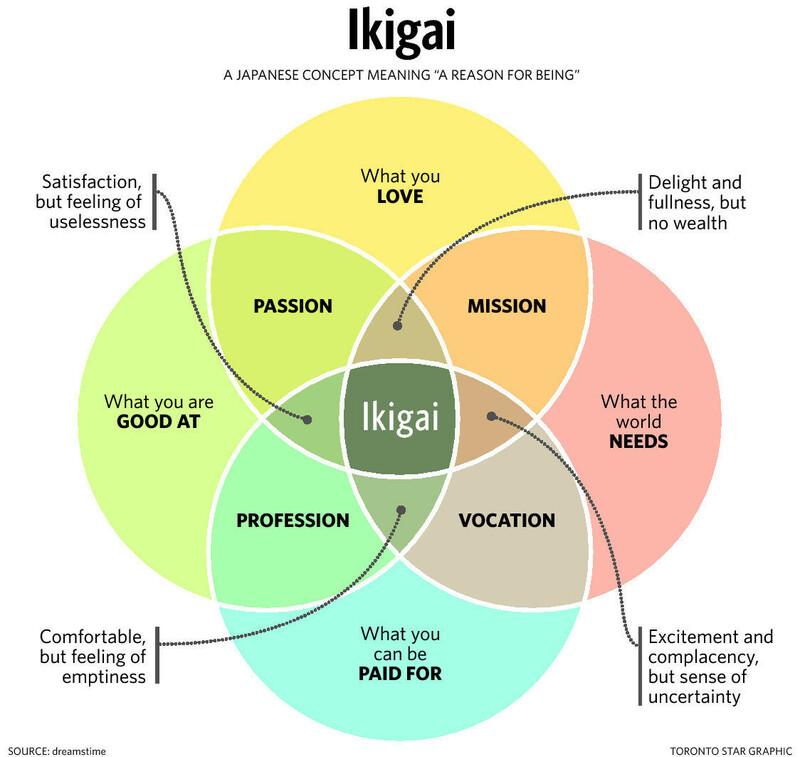 : How Japanese and Americans Make Sense of Their Worlds, told the Telegraph that how people understand ikigai can, in fact, often be mapped to two other Japanese ideas – ittaikan and jiko jitsugen. Itaikkan refers to “a sense of oneness with, or commitment to, a group or role”, while jiko jitsugen relates more to self-realization. Genes vs lifestyle: what's the key to longevity? Okinawa, a remote island to the south west of Japan, has an unusually large population of centenarians and is often referred to in examinations of ikigai - though not by Gordon. According to Dan Buettner, an expert on Blue Zones, the areas of the world where people live longest, the concept of ikigai pervades the life of these islanders. Combined with a particular diet and support network of friends or “moai”, ikigai is helping people live longer on Okinawa as it gives them purpose, he says, who provides a karate master, fisherman and great-great-great-grandmother, all of whom are more than 100 years old, as examples. Just knowing what your ikigai is is not enough – all of these people put their purpose into action, Buettner explains in a BBC interview. Researchers stress that ikigai can change with age. For anyone whose work is their reason for living, this will come as a relief as they approach retirement and begin the search for a new ikigai.